In the past, concrete repairs have been messy, expensive, and time-consuming. You may have to wait weeks for the surface to be back in service after replacement. Mudjacking is another solution, but is also messy, more invasive, and the results just don’t last as long. That’s why we use foam to repair our clients’ settled concrete. 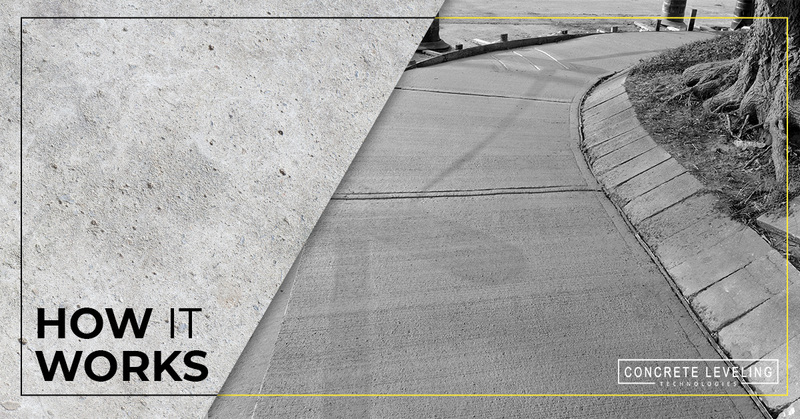 When it comes to leveling concrete, our process is quick and we guarantee you’ll be satisfied with the results. Here’s what we do: First, we drill penny-sized holes into the slabs that need to be lifted. These holes are much smaller and we require fewer injection points than mudjacking. Then, we inject a two-part polyurethane foam into the void. As the foam reacts and expands, the slabs are raised back to their proper position. When we’re done, we’ll seal the holes and you have the nice, flat surface you’ve always wanted! Not only will your concrete be level, but the poly foam will add strength and load-bearing capability to the soil beneath, ensuring that your slab is going to stand the test of time. Putting our clients’ needs first, you never have to second guess our expertise and solutions. Arriving at your site and taking an in-depth evaluation, we provide you with an effective solution to fix the problem at hand. The products we use are environmentally friendly, so you don’t have to worry about the foam breaking down over time or releasing harmful chemicals into the soil. If you are in need of an effective concrete-leveling solution, call the professionals at Concrete Leveling Technologies today and find out what has so many people talking about our quality solutions and highly respected team. When you need leveling you need Concrete Leveling Technologies. Get a free consultation today.